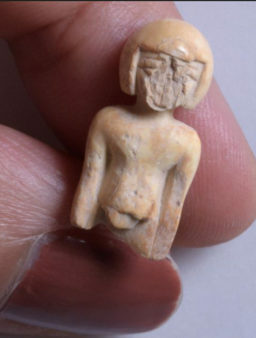 One distinct and rare finding is a small ivory statue of a woman. The figure is naked, and her haircut or wig is Egyptian in style. Evidence of the destruction of Jerusalem at the hands of the Babylonians is currently being unearthed in the City of David in excavations conducted by the Israel Antiquities Authority at the Jerusalem Walls National Park, funded by the City of David Foundation (Elad). In the excavations – concentrated on the eastern slope of the City of David, dwelling places 2,500 years old, once covered by a rockslide, have been revealed. Nestled within the rockslide many findings have surfaced: charred wood, grape seeds, pottery, fish scales and bones, and unique, rare artifacts. These findings depict the affluence and character of Jerusalem, capital of the Judean Kingdom, and are mesmerizing proof of the city’s demise at the hands of the Babylonians. The wealth of the Judean kingdom’s capital is also manifest in the ornamental artifacts surfacing in situ. One distinct and rare finding is a small ivory statue of a woman. The figure is naked, and her haircut or wig is Egyptian in style. The quality of its carving is high, and it attests to the high caliber of the artifacts’ artistic level and the skill par excellence of the artists during this era.